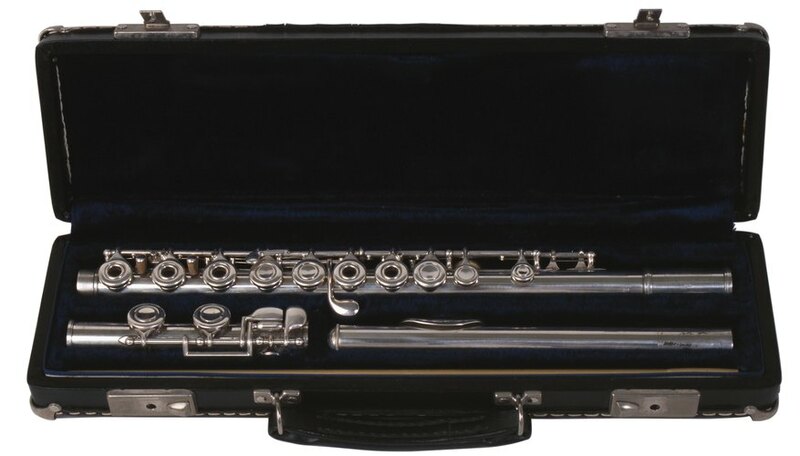 Naturally, when a new flutist gets that first shiny instrument, the thing is to explored it minutely. The player assembles, then disassembles the three joints, presses on keys and studies the mechanisms of the springs, bolder players perhaps unhooking one just as an experiment. At first the headjoint seems uninteresting, just a pipe, really, with a place for a mouth. Eventually, though, the flutist finds the cork inside, which is attached to the screw-in crown at the top of the headjoint. Adjusting this cork changes a flute's tuning. Find the grooved line ringing the bottom end of your flute cleaning rod. Insert the cleaning rod into the flute's headjoint so that the looped end of the rod is sticking out of the flute, the grooved end inside. Gently guide the rod up until it can go no farther and you can see the groove through the lip plate hole. Gauge the placement of the groove in relation to the hole. The groove should be at the center of the hole, bisecting it. Flutes are made so that the distance from the rod groove at the center of the hole to the cork is 17.3 millimeters. This distance puts the flute in tune. Unscrew the crown a bit if the rod groove is to the left of center of the lip plate hole. If the groove is left of center, it means the cork is sitting too high up in the headjoint, making for a longer and, therefore, deeper (flat) instrument. Push the crown down gently until it cannot go down any more. You have effectively shortened the instrument and made it sharper. Check to see if the cleaning rod groove is now centered in the hole. Keep pushing the crown down bit by bit until the cork is properly situated. Screw the crown down a bit in the clockwise direction. The cork should move toward the crown as you do this, effectively lengthening the internal tube length of the headjoint. This is necessary if the rod groove was right of center of the lip plate's hole, meaning the flute was shorter than it should be internally. Check the rod groove to see if you have succeeded in properly placing the cork. If the cork is moving, try again until the groove is in the proper position. If you cannot adjust the cork placement with the crown, you will have to push the cork yourself, using the cleaning rod. Insert the cleaning rod, loop side out, as if you were going to check the groove location. Apply gentle pressure to gradually nudge the cork toward the top of the headjoint until the groove is properly situated in the center of the lip plate hole. If you are adjusting the cork because you feel your flute is out of tune, be certain it's your flute and not you that is the problem. Beginning and intermediate players often go sharp in upper registers, flat in lower ones. Exercises to increase breath control and tone support are necessary as a regular part of practice. Developing a strong embouchure (mouth muscles) and diaphragm muscle are well worth the effort. Meanwhile, electronic chromatic tuners are widely and inexpensively available. These help players check their tuning as they play and develop an ear. Make sure you warm up the flute before checking the pitch, then play about mezzo forte (medium loud) in the flute's middle range. If the flute is adjusted properly, but still is out of tune across different octaves, it may be that your natural way of playing creates a perpetually sharp or flat tuning situation. If so, you might want to adjust the cork to compensate. Don't adjust the cork for temporary tuning adjustments. If you are only trying to get in tune with other players in an ensemble, for instance, pulling the headjoint out a bit from the body will cure a flute that is sharp -- the typical condition -- compared to other instruments. If you do need to play more sharply, perhaps on the lowest register, adjust your mouth or airflow as you play. Knowing how to produce different tones this way is something to practice at home. Never push the cork out through the crown end (the top) of the headjoint, which will likely damage the flute and require a headjoint replacement.